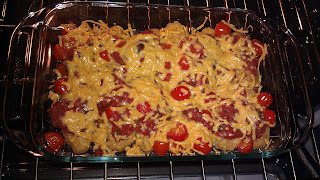 I really liked the idea of Vegan Vintage Cat's Black Bean Casserole recipe that she shared with me the other day on Twitter, so I was inspired to create a DV bake. I liked that VVC used a beans and Daiya cheese combo, so I wanted to make something that incorporated those two ingredients. I also wanted to make this high protein (if you have busy days like I usually do, you will want your dinner to be fulfilling and nutritious) so I made it a "chicken" dish. I don't prefer extra spicy, so I used mild salsa, but feel free to use spicy in yours if you want the kick. 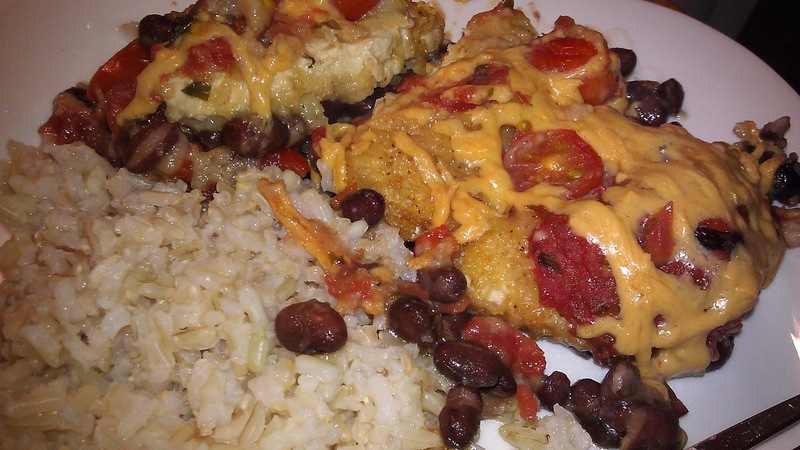 I hope you all like this Mexican bake that is packed with protein, lycopene, and other nutritional goodness. It definitely has the yum factor while using minimal ingredients that most vegans have on hand. Served this with brown rice - will try soft tortillas next time! Preheat oven 350 degrees. Layer a casserole pan with black beans. Place 12 Gardein tenders in two rows of 6. Then layer grape tomatoes and salsa on top of that. Finally, top casserole with the Daiya shreds. Bake covered for 1 hour. Bake uncovered for 10 minutes to allow the top to completely melt and slightly brown. Serve by itself, over/ in tortillas or taco shells, over rice, with tortilla chips, or even over pasta if you like! You can also add a dallop of Tofutti Sour Cream or guacamole if you want to add extra oomph. Enjoy! 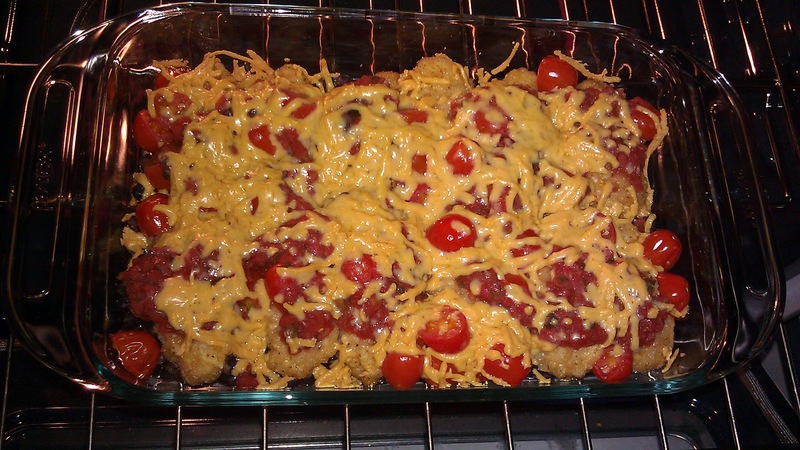 Thanks for the recipe - I have this in the oven right now! I was out of salsa and grape tomatoes so instead I am using a can of Rotelle tomatoes&chilies and halved black olives. Hopefully it still works. I am also making Spanish rice in my rice cooker to go with it. It was amazing! My husband was raving about it, he can't wait for me to make it again. And it was so easy. I think next time I will try it with chips or tortillas. 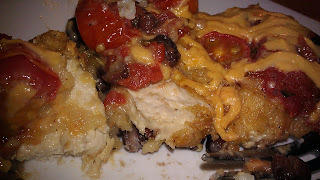 Or maybe just add corn to the casserole and serve it with some salad or broccoli! Definitely a keeper recipe. This is so good. I remember the last time I had it, quite sometime ago. I have grape tomatoes and brown rice to use up. This is the perfect recipe to make again! Thank you for your recipes and blog.